As soon as he graduated from Kyoto University, he made his national debut in NHK’s drama called “Romance.” Since then, he combined intelligence, sophistication, and a playful attitude as an actor. He appeared in other productions such as “Kuishinbo! Banzai” (Fuji TV; 1991~1993),”Asami Mitsuhiko Series” (13 episodes) (TBS), “Kaminoshizuku” (TBS; 2009), the Historical Drama series, “Nobunaga, king of Zipangu” (NHK; 1992), “Toshiie & Matsu” (NHK; 2002), “Atsuhime” (NHK; 2008), and “Hakuoki” (NHK BS Premium; July-September 2012, NHK; October-December 2012). 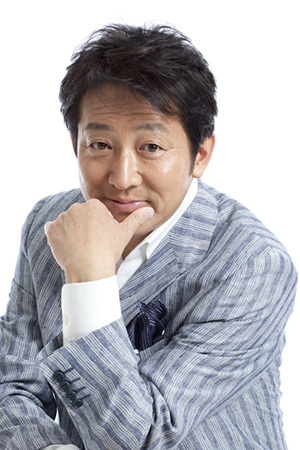 His comical acting style shown in the NHK dramas such as, “Megami no Koi” (Goddess’s Love), “Tenka”, and “Carnation” (2012) was highly praised by directors. This added to his fame and anticipation of his performance was increased. Some of the most famous movies he appeared in include: “Hashi no nai Kawa” (A Bridgeless River), “Godzilla vs. Destroyer” (1995), “Teami” (The Letter) (2003), “Ishii no Otosan Arigato” (Thanks you Mr. Ishii) (2004), “Lady Joker” (2004), “Musubime” (2010) etc. 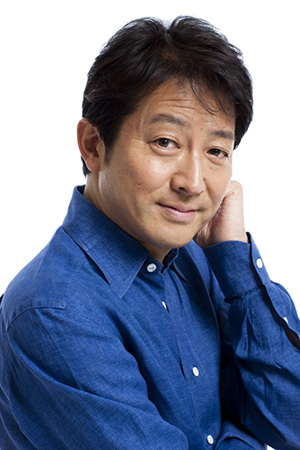 He has also appeared in numerous stage plays such as “Kusameikyu” (1997) directed by Yukio Ninagawa, “Taki no Shiraito” (2001) (Gekidan Shinpa – a new school of drama), “Toki no Monooki” (2004) written by Ai Nagai, “Yubinhaitatsuhu no Koi” (Autumn 2007), “FASHIONABLE” (Summer 2010), “Otherwise Engaged” (January 2011) written by Simon Grey, and “Koibumi Hoshino Tetsuro Monogatari” (June 2011). He attempted his firs musical in Leonard Bernstein’s “Candide” (2004) directed by Amon Miyamoto. Hi first did soliloquies “Noriokureta Yoakeni” in 2001 (20 shows) and in 2003. He wants these soliloquies to be remembered as his life’s work. His rendition of Berlioz’s “Lelio” in April 2006 during the 50th anniversary performance of Japan Philharmonic Orchestra won him highest praise for “doing an outstanding soliloquy to the accompaniment of a 250 member live orchestra.” In 2008, he joined the musical “Sound of Music” acting Captain Trapp, for the first time to sing for the audience. He has been active as an MC and director for classical concerts, a planner of overseas trips and banquets, a writer, and a television commercial actor. 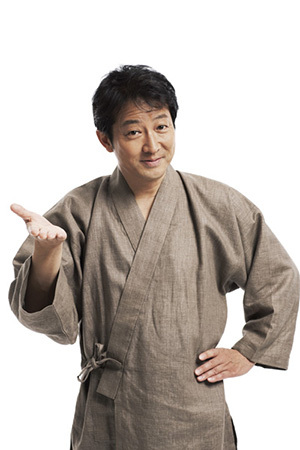 He enjoys many hobbies such as horseback riding, Japanese chess, and writing Haiku poems. He is also well known for taking part in celebrity quiz shows. He is a well-known food and wine connoisseur. He is vice president of Association of Nippon’s Wine Lovers. He was knighted by Japan Sommelier Association, and many other wine tasting organizations. He has also been active as an official in the Roppongi Men’s Choir, since its inception. In September 2003, they had their first performance in Wien and Berlin. And then alsoperformed in Cuba in May 2005, Paris and Monaco in spring of 2007. They have become internationally well-known ever since. He has deep interest in architecture and was a spokesperson for arthitecture programs such as “Renovating Family’s Dreams”, “Renovaion Dreams”, or “Renovaion Magic”. These programs were influential in boosting the popularty of home renovation. From August 2008, he is the navigator or “Tatsumi Takuro’s Iemonogatari ~ Remodel☆Kirari”, the program wich was produced by himself, introducing “REMODEL”, more advanced way of home renovation. The other program that is produced by him “Tatsumi Takuro’s Wine program”, the only TV program dedicated to wine in Japan, celebrates its fifth year in 2010, publishing the own book titled “Tatsumi Winery” in November 2009. He is a regular cast member of the TV wine tasting program called “Tatsumi Winery” (BS Fuji Sut. 22:00~, Sun. 16:00~), and “Tatsumi Takuro’s Housing Story - Remodel★Kirari -” (BS Asahi Sut. 12:00~) which he himself started. He was written many of books. The warks ae “Seisyun-no-hint” (Gakusyukenkyu-sya), “Italy Kishoku manmen” (Bungei-sya), “Michikusa no susume” (Kadokawa one them 21), “atsumi winery” (Shuppan bunka-sya), “Zerokara hajimeru wine nyumon” (MEDIA FACTORY), and others. He also wrote lirics for “KANPAINO UTA – KANPAI SONG” (July 2012) which is term song of his regular cast member of the TV program “Tatsumi Takuro’s wine Romanticism”.